When my mother Midge was diagnosed with Alzheimer’s at 55, I knew right away that I wanted to write about the unknown territory my family was entering – disorienting, devastating and strange, but also full of tenderness and love. Over the next six years I collected notes and sketches, and a few months after Mom died, I sat down on the floor with my notebooks piled around my, and cut and pasted together words and images to create the first rough version of Tangles. In Tangles my goal was to create an unsparing documentation of our family’s journey, including not only the grief, anger and fear, but also the moments of love and joy and even some dark humour. I was eager to share my experience, but quite unprepared for the enthusiastic response the book has received from critics and readers since it was first published in 2010 by Freehand, a small press in Alberta. 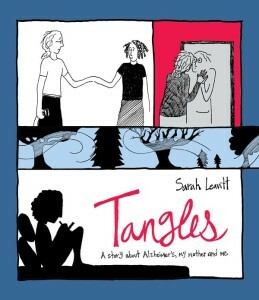 Over the past five years, Tangles has been published in the US, UK, France, Germany and Korea. UK: interviews and reviews in The Guardian, The Independent, The Irish Independent, The Jewish Chronicle, The Glasgow Herald and more — see the News and Reviews category. Canada: Tangles was a finalist for the 2010 Writers’ Trust of Canada Non-fiction Prize (first graphic narrative to be a finalist in this category); the 2011 BC Book Prizes, Hubert Evans Non-Fiction Prize; theBook Illustration category of the 2011 Alberta Book Publishing Awards; and the 2011 Alberta Readers’ Choice Award.Tangles was included in the Globe and Mail’s top 100 books of 2010 and Maisonneuve Magazine’s top 10 for 2010, and winner of the CBC Bookie award for Best Comic or Graphic Novel.